The words of the title to this page, foundation underpinning have gone from purely technical terms used by building professionals into the general language. A good foundation is a start for many non building projects and so is underpinning. In strict construction terminology underpinning means the repair and strengthening of failed or failing foundations. Foundation underpinning - Intro and causes of foundation faults. A subject like underpinning a home, can range from fairly simple to highly complex. It is not in the normal scope of a DIY handyman. For this type of job it is always best to get independent technical advice. By this I mean if the problem is large get a structural engineer's report. Don't just accept the word of a foundation underpinning contractor, who seems to have an understanding of the problems involved. Never the less that being said I will now give you some of my thoughts on the subject, in the hope that you may pick up some knowledge that will help with some of your particular problems. Just treat this page (and indeed this website as a whole) as general advice and ideas on the subject. This is not a how to manual! Before starting any foundation underpining work it is essential to find out what caused the damage.. Finding the cause is the key to finding the solution. Here are some causes of foundation failure. Simple bad workmanship, poor quality control on the job and wrong materials used for the foundations. Poor compaction, missing rebar, wrong dimensions etc.etc. 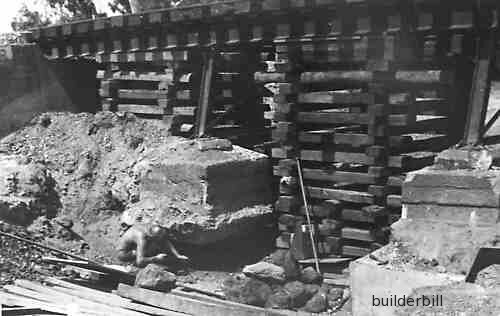 I have underpinned foundations that were built using beach sand and cement. The sulphides in the sand took about 30 years to break down the quality of the concrete, but eventually this damage threatened the stability of the house. The foundations not being designed to suit the bearing capacity of the soil. Certain areas are known to have certain soil characteristics and the professional designers/engineers in a particular location know these areas and design accordingly, but there are always exceptions. For instance, I built an addition to a house that was built on reclaimed land, virtually a land fill dump. There was no mention of this fact on the original drawing for the house. The original builder had just gone ahead with the original plan in spite of the fact that the ground conditions were not really adequate..
Not uncommon where I live is the action of tree roots, planting large trees too close to a house can actually damage the foundations. One answer is to build a root barrier, but by far the best is to remove the tree. Abnormal flooding eroding the sub grade. After a permanent repair is made it is usual to create some sort of retaining wall to stop it happening again. In certain areas mining activity can cause settling or subsidence in otherwise sound soil. Foundation underpinning - Traditional method of foundation underpinning, new concrete under the old. Foundation underpinning - Traditional style underpinning of a railway bridge foundations. The photo above is of a job that I did in 1974. The foundations of a railway bridge on the North Australian Railway had been eroded during a bad wet season by the creek that the bridge spanned. The bridge had sagged a couple of inches or so and with this method we were able to jack the bridge up to the correct level again by lifting off the "pig style" type supports. It was then easy and safe for underpinning to be done. So in this case water erosion was the cause of the damage. The foundation underpinning took the form of excavating under the existing mass concrete footings that the bridge's steel trestle supports sat on and forming and pouring deeper and wider new concrete pads. The job followed the standard method used in these cases. We excavated down to a solid base between the old foundations and used it to re prop the bridge structure to keep it secure from further damage and to keep it operable. We had iron ore trains using it every couple of days. Only one pad at a time was worked on and finished, before moving on to the next. We excavated sideways under one of the old foundation to a solid base again. Formwork was done and a new concrete pad was poured. The last part of the job was reinstating compacted fill to the level of the old creek bed. So the propping came first, then the existing structure was worked on, one pad at a time for safety reasons. It would have been easier and cheaper to do them all at once, but not safer. Foundation underpinning - Check your foundation material before building. Not really about foundation underpinning, but an old fart's ramble. You may be wondering why a person like myself, who was trained as a carpenter and joiner in a small joinery shop, (a silver arsed joiner) ever got into the rougher side of construction. "Up to my neck in muck and bullets" as we say in Lancashire. On a dark and stormy night in Sept 1957 my father who was a foreman for my uncle's civil engineering firm, (in those days known as a "Public Works Contractor") was called out of bed, to open up the company's yard and make available barricades, lights, signage and render assistance in general to the town council guys who were trying handle what later became known as "THE FYLDE STREET DISASTER". Picture a street of terraced houses (like "Coronation Street"), in the middle of a huge night-time rain storm. Slowly a hole appears in the street and houses on either side slide slowly into it. Married couples (and others) "felt the earth move". Seventeen houses were wrecked and people were evacuated from many others. Incredibly there were no serious injuries. A few weeks later as a 16 years old, I had my introduction to the rougher side of construction, working in a hole in the ground that once was a nicely paved street. I worked in a quagmire, thirty feet deep, often wearing waders, forming up sewerage manholes. This of course after my normal work of sanding doors and priming window frames. It was a great introduction to the old Lancashire ethos, "where there's muck there's money". The reason for the disaster was put down to various causes, the Coal Board (mining subsidence) was cited but denied responsibility. I was told at the time by my father that an old brick constructed sewer had collapsed and for many years maybe it had been washing away debris that made a larger and larger hole under the street. Here I quote from the archive of The Bolton Evening News. It reported in June 19, 1958, "The primary cause of the disaster was a 90-years-old assumption that the sewer was being laid on fairly substantial boulder clay when in fact it was being laid on silt clay which disintegrated. "Two other factors, says the report, are that the houses most seriously damaged and which had to be demolished were built on a 'filling' of what was once a wide valley between Hall Lane and Fylde Street and the damming of the river." So as I said previously, check the sub grade before building and if in doubt get a geotechnical report. Leave this foundation underpinning page and back to home. Define: Bearing capacity. The amount of pressure that a soil can withstand. Taking into account the sub grade conditions within a zone of influence of the foundation. Define: Geotechnical Report. A report by a suitably qualified person that ground conditions on the site. A report that defines the bearing capacity of the site. Define: Raking Shore. A raking shore is a type of prop that leans against a wall to stop it falling sideways. Define: Grout. A mortar mixture of various types. Many prepackaged grouts are polymer modified for various uses, non-shrink, self leveling, tile setting etc. For the applications on this page, micro piles may be filled with a grout mixture of just cement and water, other grouts contain sand and yet other could contain a mixture of soil from the site, water and cement. Underpinning, a few modern methods. Brick underpinning,typical methods of underpinning brick walls. Other methods from the glossary section.